With the development of technology we are moving so quickly through life, that we gradually forget the true importance of our health. With a sudden outburst of vehicles and numerous machines that tend to pollute the air, we are constantly putting ourselves at risk. And to top it all off, other than the all too expected pollution in the air, we tend to enjoy food sold by street vendors amongst all that dust and smoke. Stress in our life is yet another factor that is making us old, pulling us towards our grave. Almost every morning we find it extremely hard to fit in clothes we bought last month, we find all our eye creams are of no good when it comes to covering the puffiness under our eyes and the dark circles. However what we lack in everyday life is some routine exercises and a good healthy diet in order to stay fit. But alongside taking care of your body, I feel that you should also pay special attention to your mind. That is one should also strive to attain absolute mental peace. In order to do so, every one of us needs a break from our grinding routines every now and then. The reasons why many around the globe take refugee in places where they can experience some peace of mind, there are also those who strive to make sure that people who work around the clock do get the opportunity to relax and unwind. Travel agencies constantly provide their customers with holiday packages to exotic destinations which have the right kind of spa’s and provide the best solutions for you’re stressed out condition. One of such places in Bangkok, and many believe that with its famous spa centers, there is no better place to help you rejuvenate your true self other than the land of the spiritual monks. Bangkok provides you with the ultimate experience to help gain back your true easy going self. All you have to do is travel light, pack a small overall fit to carry your clothes for a good tan on beach, book an economy flight, and prepare yourself to be treated like business class. Being the Capital city of Thailand, Bangkok is renowned for its ability unwind a troubled mind, help those relax who haven’t felt themselves relax in a very long time. It is known for it’s clear waters, it’s warm sunny beaches and numerous yoga spots. Moreover with monks roaming about the city it is also recognized for its perfect gold temples overflowing with fresh beautiful orchids. Apart from that the city also has a bunch of water parks which will help you relax and get your life back on track. Being relaxed about your work and life on the whole will allow you to be successful in every walk of life. Usually airlines offer cheap rates for travel to Bangkok so money wont be much of a problem for you to travel. Booking tickets in advance will give you the added advantage of being able to get the seats of your choice, moreover you can also take on connecting flights which will be much cheaper as compared to a direct flight to Bangkok. Since the city itself is another one of the world’s famous tourism spots, you are bound to have an excellent time especially when you go with friends and family. There are numerous tourist spots built specifically for the travelling soul, places like Siam Water World, Grand Palace, Floating Market and many other like such are the places to be during your holiday. If you are more of the spiritual kind, you will especially enjoy the religious temples built around the city. There are numerous packages which will take you to all the religious temples in Bangkok giving you the opportunity to take a closer glimpse at the golden statues, especially the ones of Buddha. Going on this particular tour you will get to have a much closer look at the true teachings and the nature of Buddhism. If you don’t want to go on the ultimate tour of spirituality, you have many other packages with which you can enjoy the scenic beauty of Thailand. Your hotel services might also offer you honeymoon packages for the newly weds. There are also available eudcational packages for students and such. Once equipped with your beach wear, you can visit exotic beaches around Bangkok such like Pattaya, Khao Takiab and Koh Talu. You can just lie about and enjoy the clear blue waters and fresh grainy sand. A form of natural skin exfoliation really. If you lean more towards the lazy side, and don’t feel like spending too much time hunting for the best destinations, holiday packages can come in handy. You can just pick one best suitable to your needs and you personal guide will do the rest for you. You can arrange from a guide from your agent in your home country. You can talk to the agent about the kind of tour you expect and the budget you are willing to invest, he will then arrange for you the best possible options you can take on. The agent can also get you the hottest deals and discounts on accommodation. Bangkok offers you a variety of living options, for instance you can live at a hotel, a resort or even a penthouse. The tour packages that your agent will show you are made to ensure that your visit is free of all worries and you get to participate in plenty of activities that will help you relax your nerves. Bangkok also offers travel services for tourists around the city, you can hire a cab for an entire day, or even for your entire trip, yes it is bound to add up to your costs, but it is absolutely worth it. Apart from being the perfect vacation destination, Bangkok is also fit a for a shopping spree. It has the perfect malls and shopping destinations catering to the fashion elites. Apart from that if you genuinely feel fascinated with food; you will feel absolutely pleased by the various cuisines that Bangkok has to offer. Having such popular beaches and sea sides, Bangkok is also famous for it’s sea food, therefore it practically a sea food lover’s haven. 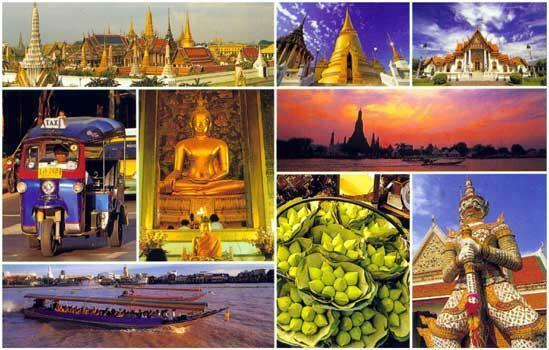 Bangkok is one locality on the face of the earth that you will want to visit again and again. Where it helps you relax, it is also the perfect vacation spot. It is one of the most beautiful places, with such scenic spots that it is the perfect place to get rid of all the stress from work. It is the perfect place to be when you are trying to break a monotonous routine. So it is about time you hop onto a flight en route to Bangkok and enjoy the true beauty of Thailand.